Detective Harry Bosch is back on the case. The Bosch TV show has been renewed for a fourth season on Amazon. Season three of the detective drama is currently in production and slated for a 2017 premiere. Based on the Michael Connelly novels, Bosch stars Titus Welliver, in the title role. The Bosch TV series cast also includes: Jamie Hector, Amy Aquino, Madison Lintz, and Lance Reddick. Christopher Backus joined season three of Bosch, last month. Here’s the Amazon press release announced Bosch has been renewed for season four. SEATTLE–(BUSINESS WIRE)–Oct. 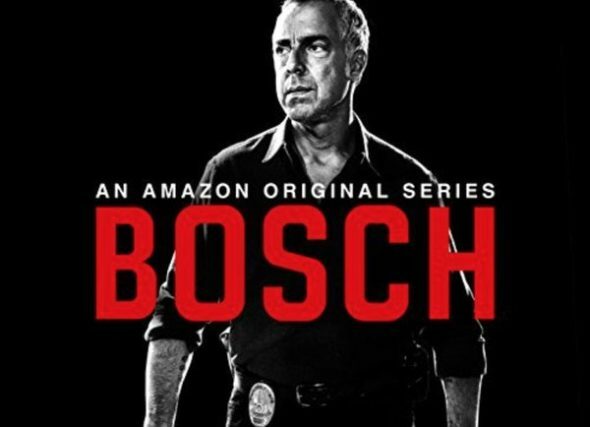 17, 2016– (NASDAQ: AMZN)–Amazon today announced it has greenlit a fourth season of the popular Amazon Original Series Bosch. Seasons one and two of the Emmy-nominated drama are now available exclusively on Amazon Prime Video in the US, UK, Germany, Austria and Japan via the Amazon Video app for TVs, connected devices including Fire TV, mobile devices and online at http://amazon.com/boschtv. For a list of all Amazon Video compatible devices, visit www.amazon.com/howtostream. Bosch is produced by Fabrik Entertainment, a Red Arrow Entertainment Group company. Season three is currently in production and slated to premiere in 2017. Based on Michael Connelly’s best-selling novels, the hour-long series Bosch stars Titus Welliver (Lost) as Detective Harry Bosch, Jamie Hector (The Wire) as Jerry Edgar, Amy Aquino (Being Human) as Lt. Grace Billets, Madison Lintz (The Walking Dead) as Maddie Bosch and Lance Reddick (The Wire) as Deputy Chief Irvin Irving. Season two has an average customer rating of 4.8, with 84% 5 star reviews. Bosch was developed for television by Eric Overmyer (Treme, The Wire, Homicide: Life on the Streets) and is executive produced by Overmyer, Henrik Bastin (The 100 Code, American Odyssey, The Comedians) from Fabrik Entertainment (a Red Arrow Entertainment Group company), Pieter Jan Brugge (Heat, The Insider, The Clearing), and Connelly. Welliver also serves as Producer. What do you think? Have you watched the first two seasons of the Bosch TV series on Amazon? Do you plan to watch seasons three and four? How many seasons do you think Bosch should run? More about: Amazon TV shows: canceled or renewed?, Bosch, Bosch: canceled or renewed? I had been reading the books when I discovered the show. Love this show & Titus! Binged through Season 1, just starting season 2! Keep it going. Great show! More Bosh, more Bosh, mmooorrre Bosh! From the beginning, Michael Connoly’s novels revealing the stories of Harry Bosch captivated me for personal reasons. The series has not disappointed me. I give it 5 stars and look forward to Season 4. It brings back a lot of memories! Bosch is terrific and head and shoulders above 99% of TV fare on the air. Can’t wait for season 4. The series is just too good, not to keep going until the cast gets tired of it. Going through the first three seasons again and hope the fourth gets to Amazon fast! The reason we joined Amazon Prime was the Bosch series, so please keep it coming. We’ve watched all 3 seasons and can’t wait for number 4. Love this show. Performances are excellent. We just started watching this summer and are finishing Season 3. So – Can’t wait for Season 4. Titus and whole cast is amazing. Excellent show and great story lines. Good twists and unexpected incidents which leaves you with questions about what is going to happen next. I have to limit myself to 2-3 episodes otherwise I would binge all day and night. Great series – looks stunning in 4k. Great performances by the main cast. I have seen all 3 seasons and have read most of the books. I cannot stop. Titus Welliver is perfect for the part. I can’t wait for season 4. Love the show. I have read all Connelly’s books and loved them. Can’t wait for Season 4 and many more. Love the Harry Bosch series! I have read all Connelly’s books. Hope they include episodes which include his half-brother the lawyer also. I think this series should be continued as long as there are Connelly books about Bosch. Can’t wait for #4. When it comes out, I’m sure I will watch straight through to the finish in one sitting. I’ve just did a marathon of seasons 1-3! Can’t wait for a Season 4! I’ve read ALL of Connelly’s books too. Bosch is one of those compelling series you can’t stop watching. Excellently portrayed by Titus Welliver. It’s in the same class as Dexter. My former favorite!